Omid and I are back from our mini vacation. 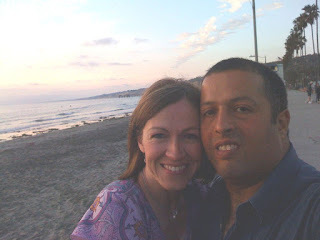 Omid was in San Diego on business and I went for a much needed break from reality. We had a lot of fun. 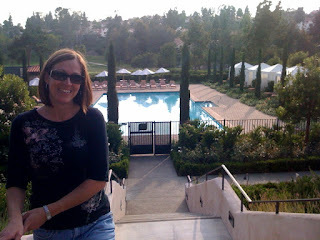 If you ever get the chance to stay at the Rancho Bernardo Inn...do! The grounds were so beautiful. 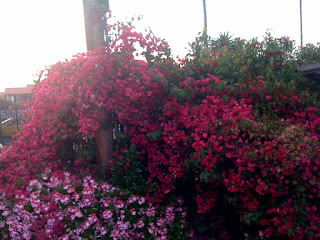 Everywhere we walked, we smelled jasmine, lavender, rosemary, roses and orange blossoms. The resort also has it's own golf course which is beautiful. Me at the spa pool. 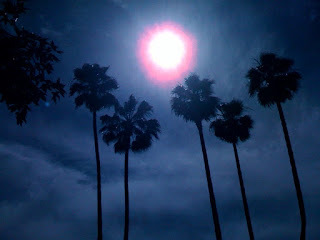 This shot reminded me of the "W" in It's Mad, Mad, Mad, Mad World. Love that movie! 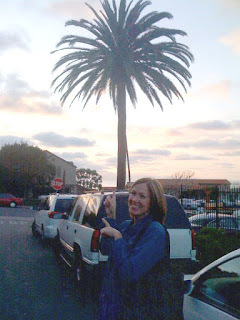 The first night we went to La Jolla for dinner. 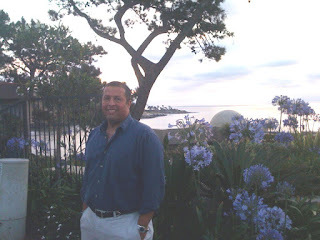 We were told some of the most expensive real estate in the US is in La Jolla. On the beach before dinner. We went to The Marine Room for dinner. It was absolutely beautiful. It's right on the ocean. We had a seat right next to the window. We felt underdressed & extremely poor. One bottle of Cabernet went for about $378. I don't have to tell you we ordered the cheapest bottle on the menu: $54. I think I heard our waiter 'sniff' contempt when I ordered that bottle. Oh well...we had a good time and were together - that's all that mattered. Million dollar view. 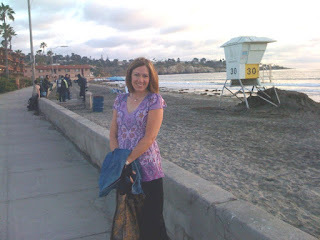 Sea lions were barking away (on the beach below). 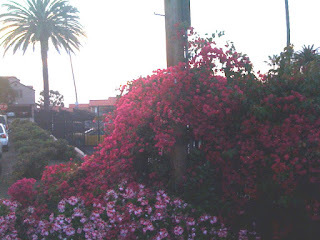 Beautiful bougainvillea. I loved this stuff! It was everywhere. Same shot - but I tried to get the ocean in this time. 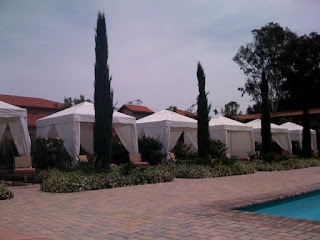 The next day, Omid surprised me with a day at the spa! He went to work and I enjoyed myself thoroughly. After the spa, I hung out by the pool and read. I finished two books. It was wonderful! 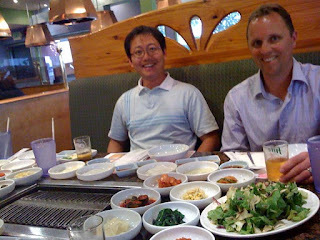 Later that night, I met Omid and his coworkers for dinner at a Korean BBQ. 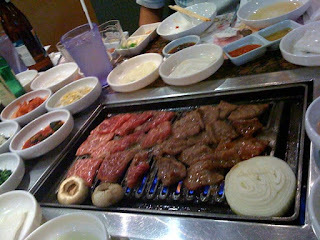 We ate kalbi (Korean short ribs). Yum! Mickey preparing a 'honey bomb' for me. 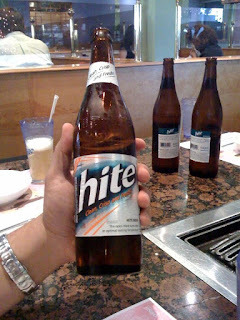 This is a Korean specialty. It consists of 1/3 beer (in a beer glass). 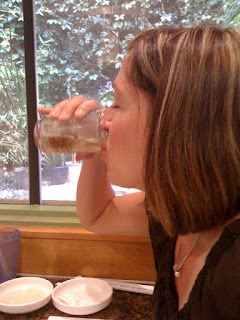 Then a shot glass (glass & all) of Coke is dropped in. 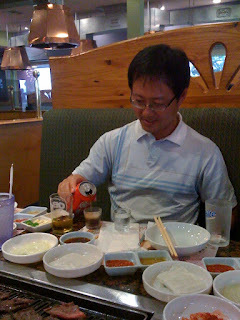 After that, a glass of Shoju (Korean liquer) is dropped on top of the Coke. You drink it in one shot! Afterwards, everyone applauds. 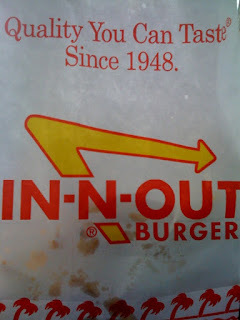 Everywhere we went, people would ask us if we tried In-N-Out Burger. 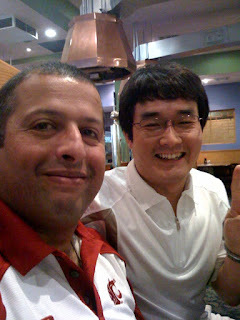 Omid had to leave on an earlier flight, but I managed to stop by on my way to the airport. 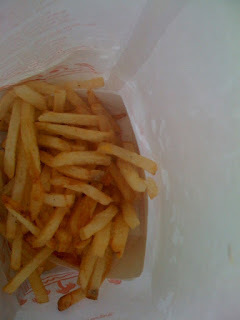 The fries are handcut right in front of you. Fresh- not frozen. 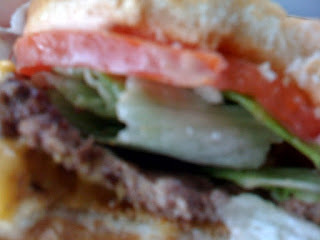 Bottom line: It tasted no different than Burgerville to me - with two exceptions. One: the bun was toasted. Two: It was a lot cheaper! I still think the BEST burgers & fries of all time are to be found at Cougar Country Drive Inn in Pullman! Yes, yes, yes! Cougar country is the best. Go Cougs! I'm glad you had a great mini vacation.